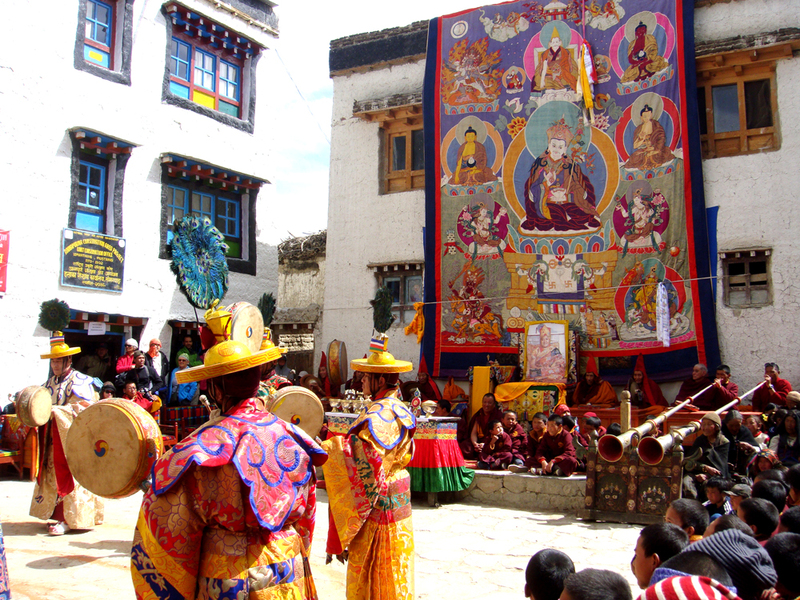 The Tiji festival, locals calls Tenchi Festival is annual three days monk dance festival celebrate every year in Upper mustang , Lo manthang . According to Tempa Chhirim , Tenji: commonly pronounced Teeji or Tiji means “Prayer for world peace”. Please fill the form below for booking this tour .We shall confirm you instantly . Have any question(s) regarding this tour? Please fill form below our team get you back ASAP! Three days Tenji commemorates for the victory of Buddha’s incarnation. It’s also victory by Dhorji Sonam (A monk) over demon called “MA TAM RU TA” – The wax-man eater and who cased storms and droughts to destroy people’s house and livestock. Three days victory mask dance perform by monks from Chhyode Gumba (Monastic School , Lo-manthang) , a unique dance with ancient mask and swords . Three days mask dance shows about enact the harassment of Demon MA TAM TU TA to people, birth of Dhorji Sonam (Buddha incarnation) . It’s also shows Dhorji Sonam’s attempt to return demons to Buddha realm. The First Day of Teji Monk dance called “TSA CHHAM” and Second Day called “NGA CHHAM” . Three days festivals starts from offering by seven villages(All village of Upper Mustang) representative offering their harvest to Dhorji Sonam to protect their food from storms . And end the festival , once victory over demons by Dhorji Sonam . All villagers take Demons statue out of village and throw away . Looking for Tiji (tenji) Festival 2019 Dates – 31 May 2019 to 02 June 2019 Permit Buddy ? Get touch with us. Looking Only permit Buddy for Upper Mustang ? Arrival at Tribhuban International Airport ,our representative greet you and transfer to Hotel Shanker by private Car. 6:30 am flight from Pokhara to Jomsom (15 Min Flight), breakfast in Jomsom and Commencing trek to Kagbeni (3.5 hrs easy walking following bank of Kaligandaki river ) . Lunch in Kagbeni . Evening visit in Kagbeni village, Red monastery . Overnight at Shangi-la Hotel, Kagbeni (2810m) . [B, L, D] – Small Family run homestay/tea house . Early breakfast in Kagbeni and start trek to Tsaile Village(3050M) . First day of restricted zone trekking 15KM, 5-6 hrs, We pass through Tangbe village (3060m), Tetang village (3040m), Chuksang village (2980m) . We take Lunch in Chuksang village . Overnight in Tsaile village(3050M) . [B.L.D.] – family run teahouse/homestay Mustang Gate Guest House. Overnight in Shenmoche (3400M), A small road side motel village .[B.L.D. ]- Family run Teahouse ,Nilgiri view Hotel. Early breakfast in tea house and start trek to Tsarang(Charang) village (3645m), one of the biggest village in upper mustang. We pass through Gheling village(3500M) , Nyi La (4010m), Lo-Ghemi Village (3500m) (6-7 hrs). Evening Monk guided village tour with 800+ Monasteries , Old Palace and Museum . Overnight in Tsarang(Charang) village (3645m) .[B.L.D. ]- Family run Teahouse ,Hotel Monalisa. Breakfast and follow our journey towards to destination “The wall city Lo-manthang (3800m)” through beautiful Stupa, magnificent landscape , its a easy walk of 3 hrs. Lunch in lo-manthang guest house,short rest and participant on opening ceremony of Tiji festival 2019 (starts around 2 pm and end at 5 pm). Overnight at Lo-manthang guest House (3800m) . [B.L.D.] – Moderate service guest house. Breakfast and pony ride to Chosser Cave (3900m) and monastery (2 Hrs ) , lunch in guest house, short rest and ready for second day of Tiji Festival 2019, start around 1 pm and end around 6 pm) . Monk guided tour to 4 important monastery in wall city , rooftop view from locals house roof and visit to Royal Palace. We do participant daily chant on Monastery. Lunch at hotel and ready for final day of Tiji Festival , start around 2 pm and end around 6 pm) . Breakfast in Guest house and trek back to Ghemi Village (3500m) via Drakmar (3700m) and Ghar Gompa (3950m)(7 hrs ) . Overnight at Lo-Ghemi guest House (3500m) . [B.L.D.] – Moderate service guest house. Morning trek to Samar village via Gheling village (5 hrs). Overnight at Annapurna guest House (3500m) . [B.L.D.] – Basic service guest house. Easy downhill walking towards Chusang village (2980) for overnight 6 hrs. Overnight at Annapurna view guest House (2980m) . [B.L.D.] – Basic service guest house. Overnight at Hotel in Muktinath (3710m) . [B.L.D.] – Full service Hotel. Trek down to Jomsom , easy walking via Jharkot village -5 Hrs . Overnight at Hotel Majesty in Jomsom (2743m) . [B.L.D.] – Full service Hotel. Early fly back to Pokhara and Connecting flight to Kathmandu or drive back to Kathmandu . Farewell dinner with traditional cultural show. Transfer to airport as per your schedule. Trip concludes. Attraction of the trek – Beautiful Landscape , Old Monasteries , Muktinath Temple , Caves. Himalayan Sights- Nilgiri , Muktinath Himal, Dhaulagiri Culture – Tibetan culture, Bon and Hindu culture , Buddhism. Activity – Trekking and Cultural excursion , Pilgrims Tour, Heritage rail. Highlights of trip – Lo-Manthang , Kagbeni Village , Chhoser Cave and Most waited Mask Dance , Tiji (Tenchi) festival 2019. Can Join from Jomsom or Kagbeni. ***All Above Cost are based on minimum 2 person. For Solo Trekker please write us , we do arrange for you . Kathmandu Airport pickup and drop by private vehicle . 3 Nights Kathmandu in Hotel Shanker and 1 night in Pokhara accommodations in Hotel Kantipur . Local guided sightseeing in Kathmandu on private basis . All ground transportation on private vehicle , Pokhara-Jomsom-Pokhara flight ticket . Eco trained government licences trekking guide, porter, Upper Mustang cultural expert local monk Guide (support guide : Monk only guide in Monasteries) . All staffs salary , wages, food , accommodation , transport and Insurance . Upper mustang Trekking travel permit, Annapurna Conservation Area (ACAP) Permit, Local community charges and Mustang Monasteries entrance fees . Half day Pony ridding From Lo-manthang to Chhosser Cave and Back . All Taxes , VAT and local government charges. Duffel Bags for trekking . International Transportation to Nepal and Back. Nepal Entry or re-entry visa fees . Please read Nepal visa fee. Tiji Festival 2019 visitors photography Permit (Collected by monastic school for help to buy cooking gas for student in monastery) . Hot water, Bottled water or any drinks during the treks . Lunch / dinner in Kathmandu and Pokhara. Personal nature expenses e.g. phone calls, laundry, bar bills. Tips for the trekking crew. Other optional trips/activities and sightseeing if required. FAQ 1 :What is payment Terms for Tiji festival 2019 Trekking? Please send your details to us by email , in Normal conditions we collect cash on your arrival in Kathmandu . FAQ 2 : How Can I book ? For booking Upper mustang tiji festival Trekking 2019, please email us to booking@ecoholidayasia.com or fill booking form on this page or can call our team directly to +97714260072 / +9779849027214 (24X7 Available Call | Whatsapp| Viber| Wechat) . FAQ 3 : We are Old people, can we Join Tiji Festival 2019 Trek ? Its depends on your physical conditions . IF you are fit you can join trekking option for Tiji 2019 , if not you can choose 4WD Drive tour for tiji festival 2019 . FAQ 6 : How about group Size of your tour? We aimed to provide quality service in affordable cost . in a tour our maximum size of group is 6 person a group Trekking . FAQ 7 : How secure we are ? We first concerned about your security, comfort and entertainment during the trip . We highly care about your health and your comfort . Do not need to worry about this during the trip , we take care after you .